The first time I tasted a French Macaron I wondered why they were so popular. It wasn't until my son brought me a box of Pierre Herme's Macarons from Paris that I finally knew why this pretty petit four was taking the world by storm. The combination of two almond flavored meringue cookies sandwiched together with a tasty filling is delightful. Macarons are made with just four ingredients, ground blanched almonds, confectioner (powdered or icing) sugar, superfine white sugar, and egg whites. Yet it is amazing how these four ingredients can make such a perfect cookie. A cookie with a thin crust that breaks so easily when you bite into it, while inside it's wonderfully soft and moist, with a mildly sweet almond flavor. The technique for making Macarons is a little tricky as there are so many factors at play here - the quality and amounts of ingredients, the mixing of the batter, the pans, the length of resting time, the oven temperature, and the baking time. Any or all of these things can cause problems. Some common problems are that the Macaron doesn't have a 'ruffle' or 'collar' (called a 'foot') on the bottom, or that the 'foot' is more horizontal than vertical. Or maybe the tops of the cookies have cracks or are too domed shaped, or uneven, or even lumpy. Sometimes the cookies can be lopsided or the insides of the cookes are too chewy or dry. Unfortunately it usually takes multiple attempts to get the perfect Macaron, so I recommend taking notes, keeping track of everything you do. That way if you have problems, you can refer to your notes and make adjustments. Because you will find that in your kitchen, with your ingredients, with your oven, you may have to adjust the recipe. After making Macarons more than 20 times, with lots of note taking, I have come to some conclusions. First, use top quality ingredients, and to get accurate amounts of each ingredient, measure by weight (grams), not volume. (This is why I don't give 'cup' measurements.) (I use a digital scale for measuring.) Next, the egg whites need to be 'aged', which means separate the eggs at least a day (and up to 5 days) before making the Macarons. Cover the egg whites with a piece of paper towel (to let the whites breath) and place in the refrigerator. Then, several hours before making the Macarons, remove the whites from the refrigerator and bring to room temperature. (This ensures that the whites will reach their full volume when whipped.) Next, the ground almonds. You can either buy almond meal/flour or you can take whole blanched almonds and process them in your food processor until finely ground. Even though I always use ground blanched almond meal/flour (I use Bob's Red Mill finely ground almond meal/flour), I still process it in the food processor, along with the confectioner (powdered or icing) sugar (use powdered sugar that contains cornstarch (corn flour)), for a minute or two until finely ground. Once that is done, sift the mixture to get rid of any large pieces of almonds. There are two parts to the batter, making the meringue and then folding the almond/sugar mixture into the meringue (called macaronage). Each part must be done correctly. As always when making a meringue have your mixing bowl and wire whisk clean and free of grease. Once you have made the batter and piped the cookies onto your baking sheets, it is important to let the cookies rest before they are baked. Normally they need to sit between 30-60 minutes (depending on the humidity and temperature of your kitchen) or until they are no longer tacky when lightly touched. Oven temperature is also so important and there is quite a debate on what is the optimum oven temperature for baking Macarons. Some like 300 degrees F (150 degrees C), I prefer 325 degrees F (160 degrees C), while others like 350 degrees F (180 degrees). There is also a debate on whether they should be baked using convection and whether you should bake two pans at once and even whether you should double pan. Also, buy a free standing oven thermometer as oven's have a tendency to run a little hot or cold. In closing, even though making Macarons is quite challenging, it's worth it. Every time I make them I still can't believe how beautiful they look and how delicious they taste. You will definitely feel a real sense of accomplishment. So practice practice practice. For more help there is an excellent food blog that I highly recommend, called notsohumblepie.com. Ms. Humble (as she is called) has done extensive research on the subject of making Macarons. She even has a "Macaron Troubleshooting" article that outlines the various problems (and reasons why) that can occur when making Macarons. I found it very helpful. French Macarons: Have ready three baking sheets (make sure they have flat bottoms (no warping)) lined with parchment paper. To make all the Macarons the same size, I like to make a template. Take a piece of parchment paper and draw 20 - 1 1/2 inch (3-4 cm) circles, spacing the circles about 2 inches (5 cm) apart. Place the template under your parchment paper so you can use it as a guide. Place the ground almonds and confectioners sugar in a food processor and process until finely ground (about 1 - 2 minutes). Sift the mixture to remove any lumps. In the bowl of your electric mixer, fitted with the whisk attachment (can use a hand mixer), beat the egg whites and cream of tartar, if using, on medium speed until foamy. Gradually add the sugar, and continue to beat, on medium-high speed, until the meringue just holds stiff peaks (when you slowly raise the whisk the meringue is straight up, no drooping, called a 'beak') (but do not over mix the meringue or it will 'break'). Then, in three additions, sift the ground almond/sugar mixture over the meringue. When folding, cut through the meringue and then fold up and over, making sure to scrape the bottom and sides of the bowl. Once the almond mixture is completely folded (called macaronage) into the meringue (the batter will fall back into the bowl in a thick ribbon) it is time to pipe the Macarons. Fill a pastry bag, fitted with 1/2 inch (1 cm) tip, with about half the batter. Pipe about 1 - 1 1/2 inch (3 - 4 cm) rounds onto the parchment paper, using the template as a guide. Then gently tap the baking sheet on the counter to break any air bubbles (can also break air bubbles with the end of a toothpick). Let the Macarons sit at room temperature for about 30-60 minutes (depending on the temperature and humidity of your kitchen) or until the tops of the Macarons are no longer tacky. Meanwhile preheat your oven to 325 degree F (160 degree C) with the oven racks in the top and bottom third of the oven. Bake the cookies (two sheets at a time) for about 14 - 16 minutes, rotating the pans top to bottom, front to back, about halfway through baking. The Macarons are done when you can just barely separate the cookies from the parchment paper (there will be some browning of the cookies). (If you find that the bottoms of the cookies brown too much, double sheet your baking pans.) Remove from oven and let the Macarons cool completely on the baking sheet placed on a wire rack. To assemble the Macarons, take two cookies and sandwich them together with your filling (place filling on flat side of cookie). 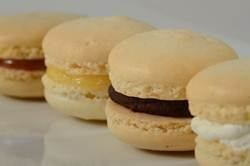 Popular choices are a Swiss buttercream frosting, lemon curd, chocolate ganache, jam, or dulce de leche. While you can serve the Macarons the day they are made, these cookies really need to mature for a day or two in the refrigerator. Best served at room temperature. Note: Weight measurements (grams) (use a digital scale) are only given for this recipe. Volume measurement (cups) are not recommended. * I use Bob's Red Mill finely ground almond meal/flour. You can find it in grocery stores, specialty food stores, health food stores, or on line. ** Use powdered sugar that contains cornstarch (corn flour). *** Separate eggs at least 24 hours before using (or up to five days). Cover with paper towel and place in the refrigerator. Bring to room temperature before using. **** Make superfine sugar by processing regular granulated white sugar in your food processor for about 30 seconds or until sugar is ground very fine.